I also found through the Harper’s Monthly website the following information. “Mark Twain’s first article in Harper’s was miss-attributed to Mark Swain. 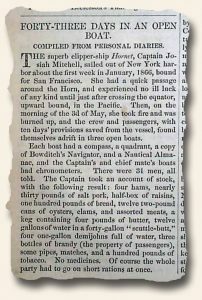 The story, “Forty-three Days in an Open Boat” (December 1866), is an account of the Hornet, a clipper ship that caught fire in the ocean, leaving its crew adrift. Twain referred to it as the “first magazine article I ever published,” though he had published numerous pieces in other periodicals and newspapers under such names as Thomas Jefferson Snodgrass; W. Epaminondas Adrastus Blab; Rambler; Grumbler; and Peter Pencilcase’s Son, John Snooks. Mark Twain was born thirty-one years earlier, and two months premature, as Samuel Langhorne Clemens, in Florida, Missouri. “When I first saw him I could see no promise in him,” his mother said. The Clemenses moved several miles upstate, to the Missouri River-side Hannibal, when he was four; the town would later inspire the fictional St. Petersburg of his two most famous works, The Adventures of Tom Sawyer (1876) and The Adventures of Huckleberry Finn (1885)…”. Twain didn’t turn out too bad after-all!